Location: On the south side of Station Road (B6265) A new road called Piece Fields occupies the site of the station. Notes: Grassington & Threshfield station was opened by the Yorkshire Dales Railway (YDR) on 29 July 1902. 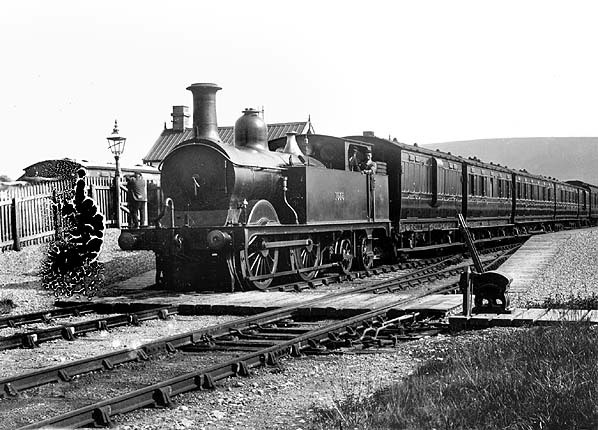 (The official opening date is 30 July 1902 but four public trains ran the previous day) The station was situated at the end of a 8.75 mile branch line, The Grassington Branch, which diverged from the Skipton to Ilkley railway, at Embsay Junction. The original intention of the YDR had been to continue the line northwards to Darlington but this never happened and Grassington and Threshfield station became their northern terminus. Grassington & Threshfield station was actually located in the village of Threshfield which is on the west side of the river Wharfe. The station was built at this location because it would have been very expensive to build a bridge across the River Wharfe in order to reach the larger settlement of Grassington. When it first opened the station was provided with two platforms. A single story timber building which provided the usual facilities was located on the east platform. (At some point during the stations history, possibly after closure, the west side platform was removed). Three sidings, a vcattle loading dock, a 3-ton lifting crane, a weighing machine and a goods shed were provided to the east of the passenger station. The 'Railway Clearing House Book of Stations 1904' listed the station as being able to handle general goods, parcels, furniture vans, livestock, horses and private carriages. The station had a 3 ton lifting crane. There was also a connection to a quarry tramway that served the Threshfield Lime Works. The connecting line diveged from the Grassington branch at the south end of the station and it ran west for a few hundred yards. The connection was also provided with sidings. At the time of opening passenger services were operated by the Midland Railway (MR) mostly running between Skipton and Grassington & Threshfield calling at the only intermediate station on the line at Rylstone. Excursions ran from various destinations during the summer months. 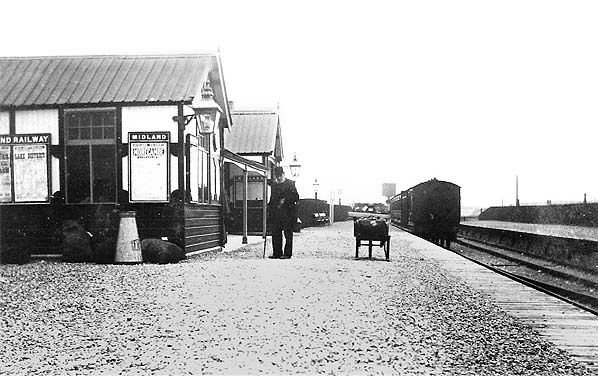 The station was initially called Grassington but was renamed Grassington & Threshfield in October 1902 although this name didn't appear in timetables until May 1903. The July 1922 timetable showed six departures and seven arrivals Monday-to-Friday. On Saturdays there was one less departure as seen in the table below. Two trains ran in each direction on Sundays. The YDR remained independant until the 'Grouping' in 1923 (with services worked by the MR) when the Grassington branch became part of the London Midland Scottish Railway (LMS). During the 1920s the branch suffered from bus competition and the LMS withdrew the regular passenger service on 22 September 1930 (only 28 years after services had begun). The LMS summer timetable for 1932 showed an alternative service was provised by the West Yorkshire Car Company Ltd (see below). Goods services continued to run and the station handled large volumes of agricultural produce as well as general goods for the local area. Quarry traffic was also bouyant. The countryside around Grassington & Threshfield station was popular with walkers in the 1930s and the LMS ran excursion trains from major cities such as Leeds. On 1 January 1948 the Grassington branch became part of British Railways [North Eastern Region] (BR[NER]). Passenger excursions contined to run during the summer months and the station continued to handle goods but as the 1950s progressed in ever decreasing amounts. The 'Handbook of Staions 1956' listed the station as still being able to handle general goods, parcels, furniture vans, livestock, horses and private carriages. The quarry connecting line was listed as being a private siding of the Settle limes Ltd, Threshfield Lime Works. Summer excursions continued to run into the station. There was an excursion from Manchester Victoria on Sunday 30 August 1959 which arrived at 12.43pm and departed at 7.00pm (click here to see the timetable). Trains such as these were popular with Ramblers and organised walks were held such as one that was advertised by the railway for 15 September 1959 (click here to see hand bill). Goods services continued to run to Grassington & Threshfield until 11 August 1969. The last excusion ran on 20 August 1969. The excursion was promoted by the Yorkshire Dales Railway Society and ran some 67 years after the opening of the line. 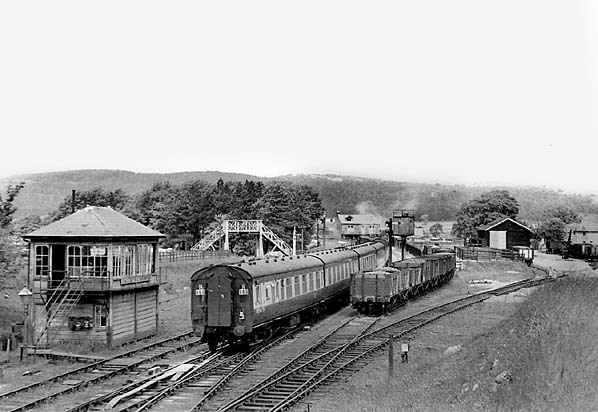 The track was then lifted from the station to a point just over one mile to the south where the Swinden limeworks was located. Daily freight services continue to operate along the branch to the works. 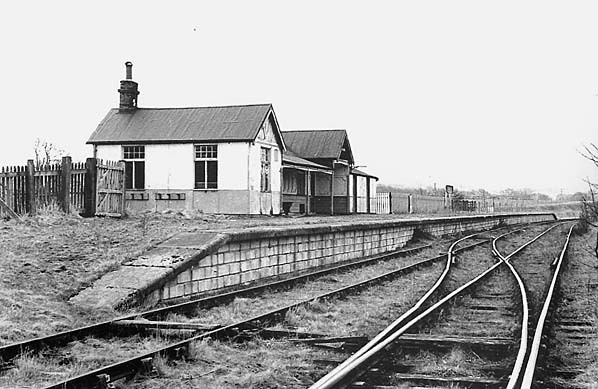 The station building and platform were all demolished after closure. A housing estate was built on the site of the station. Grassington & Threshfield station looking south shortly after it had opened. Just arrived is a passenger service from Skipton. Grassington & Threshfield station shown on a 6-inch scale map from 1906. Grassington & Threshfield station shown on a 25-inch scale map from 1906. The extensive goods facilities are clearly shown. Looking south towards Skipton at Grassington & Threshfield station in 1905. Grassington & Threshfield station looking north in June 1952. 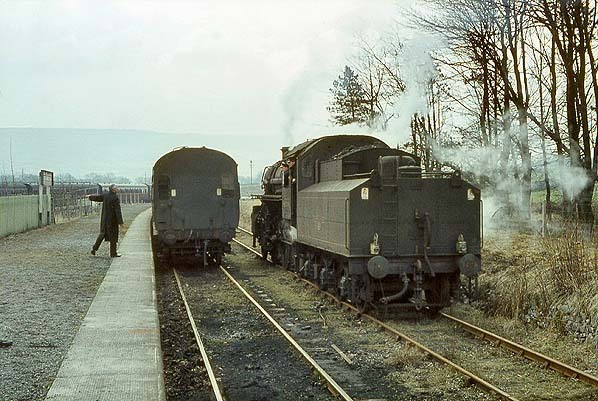 An excursion train seen at Grassington & Threshfield station in March 1964. Grassington & Threshfield station looking south in 1964. 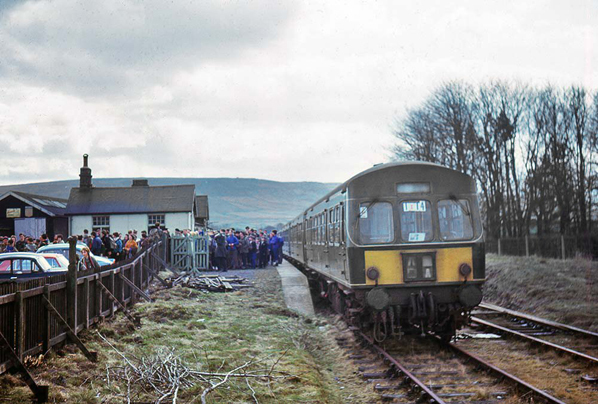 A view of Grassington station looking south in the late 1960s. 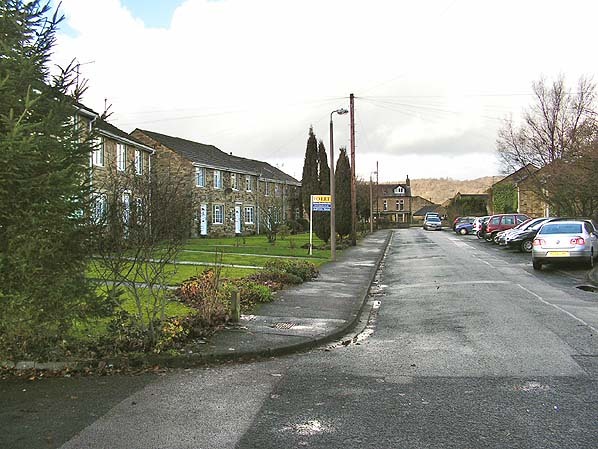 Looking north at the site of Grassington & Threshfield Station in December 2007. The station site had been developed as a residential area.